What inspires employees to show up for work every day? Money obviously, but there's more to a happy and productive work environment. When you work in construction, satisfied customers are obviously your first priority. You want them returning to your firm for future work and referring you to others. But your employees are also important customers. And a study conducted by the British Journal of Labor Economics showed that when employees were laboring in a work environment that made them feel "happier", they were 12% more productive on the job. That particular study has met with some controversy over methods used to achieve this "happiness". 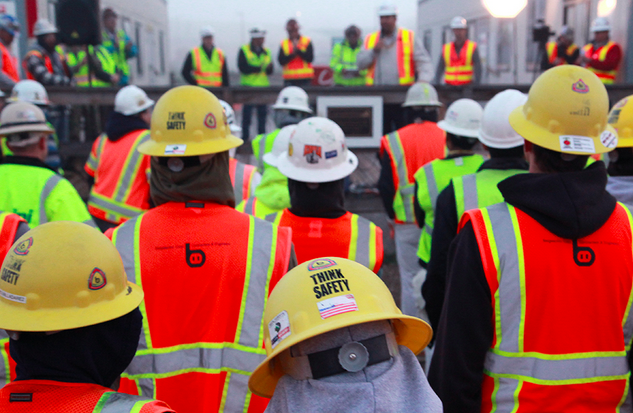 But many managers and supervisors site examples at their own firms not only of greater construction labor productivity, but safer and more efficient workplaces when workers really want to be there. A number of these firms are in the construction industry. Their secrets for a workplace that truly works in every sense of the word? Conduct SurveysYou can't know what's going on unless you ask, right? Such surveys should be short, easy to complete, and of course, anonymous. These surveys are best completed via the Internet, and should be created and "graded" by a neutral professional service such as Survey Monkey. And it's not enough for managers to simply read the results of the surveys, but to act on them in a positive way. These surveys not only provide insight into employee feelings, but can highlight real firm problems upper levels may not be aware of. Offer Advancement ProgramsEmployees in these surveys state repeatedly that they perceive an employer that offers training, leadership, and mentor programs as one that cares about them. And employers benefit too from having better trained employees and ones who bring experience and new perspectives as they move among levels of a firm. Walk The WalkA construction firm with different levels of ethics, values, and rules for different levels of employees is a good breeding ground for resentment and suspicion. There should be a single set of standards for all employees with the same ramifications if they are broken. Respect EmployeesManagers, your job is to keep all workers comfortable by offering training and monitoring and building work relationships. You should also be offering extra assistance like bilingual signage, gender specific restroom facilities, and more. Yes, this will mean more initial effort on your part. But the end result will be focused, happy construction workers and overall happy team.